When my teacher told me that I was going to travel to Cyprus I felt very excited and I could not wait until the day I was going to fly. It was my first trip abroad. The first day we got our flight from Bulgaria to Cyprus early in the morning. It was not the first time I was about to fly but I was feeling very happy and excited about it. The fight lasted two hours and when we landed we had to travel from Larnaca to Polis for another two hours. When we arrived at the hotel we met the other students and it was actually a day off because not everyone was there so we had to wait for them until the next day. The second day we got up, had breakfast and went to the school of the Cypriot students. They welcomed us with songs, music and dances. It was very fun and I enjoyed it a lot. We made friends from there and even some of the students were Bulgarian. Later we had sports activities. We were separated into two groups. The boys were playing football and the girls volleyball. However some of the boys joined our team and it was awesome! After that we had lunch at a local restaurant. Later we spent some time with our new friends until it вас time for dinner. Day number three. The first day after having breakfast was to go to the school. There we had a meeting. We were presenting the photos of each country. Everyone had amazing photos and the English team won. After that we had free time so we spent time at the beach and exploring Polis. Wednesday. At 9:30 our bus left for Kathikas’ winery. There we tasted different types of wine. We learned about how the wine was made and a lot of other things. Later we went to the Baths of Aphrodite. Then we had lunch had a walk in the local area and went to the Archontariki tavern for dinner. Thursday. In the morning we went to visit “Petra tou Romiou” then the museum of Palaipafos (Kouklia) and after that the Mosaics in K. Pafos. We learned a lot about the history of those places and everything was very beautiful and interesting. After the intriguing tour we had lunch. In the afternoon we went to the mall of Pafos. On Friday we went to the school for the last time because it was the last day we were staying. We met with our friends from there and went to a meeting with the mayor. After lunch we had free time and got out with our friends and had fun till the evening. On the next day we had our flight to Bulgaria. The meeting in Cyprus was one of the best experiences that I had. I learned a lot about other countries, because when we speak with different type of people, we learn habits, traditions and characteristics without realizing the importance of that at the moment and this really helped me. In the future this can give us advantage in the work, because we will need these skills to communicate with other people from other countries. This was the first time for me to take a flight, I don’t know with what word specifically I could describe the feeling I had. I was a little bit nervous and excited at the same moment. However, it wasn’t frightening at all. When we arrived in Larnaka we had a funny taxi ride to Polis. When I saw the hotel for the first time, my first thought in my head was ,, Damn, it’s awesome”. I really enjoyed the weather there, because it was warm everyday. While I was in Cyprus, I met lovely people. Everyone was very kind and polite to each other. I was impressed by the way some of them spoke English, especially students from Lithuania. One of the days when we were there, we went to the school in Polis. The school wasn’t very big. I’m sure that it’s not only me, but everyone made a lot of friends there. The students were polite and I hope that we can keep in touch in the future. When we went to school there was a concert. After the concert there were sport activities. I really enjoyed that. The hosts organised a volleyball tournament and I enjoyed every second of the game. On the other day we went to ,, Bath of Aphrodite” and after that we went to ,, The stone of Aphrodite”. I have no words to describe these two places, the view on ,,The stone of Aphrodite” was breathtaking, I felt like I’m in ,, Pirates of the Caribbean”.We had one day, that was our ,,free day”, it was really nice and I’ll never forget it. 28th of March-very special date for Gabby and Gabby. 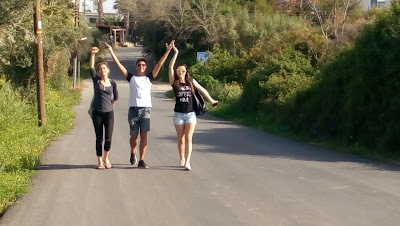 This is the day when we travelled to Cyprus. It was so special because we had name day. There were a lot of things that I liked. First of all, when we arrived in Larnaca, a bus driver waited for us at the airport and he drove us to Polis. When we were in Pafos, the bus broke down and we had to wait for the man to repair it. We were at a gas station, when we first saw Bulgarians. I was so surprised by hearing my own language. But it was only a small drop in the ocean of Bulgarians that we met in Cyprus. We arrived at the hotel in Polis safe and sound. SURPRISE-most of the people, who worked at the hotel were Bulgarians. They told us about the little walks, the nice restaurants and other good secrets in the town. At the evening we met all the people from the other countries. It was a boring night, because everybody was so shy and didn’t talk a lot. The next day was the meeting in the school. We were walking between the classes and I really liked the kitchen in the school and talked a lot with the teacher. But my favorite person was the dance teacher! We played volleyball and she was the referee. After that she asked us if we wanted to dance. Of course! We are Bulgarians, we love to dance! I liked this woman so much because she taught us some Greek dances, some latino and then she asked me and my friends: “where are you guys from?”; “Bulgaria” we said; “Bulgaria!” and she started dancing a traditional Bulgarian dance. I was so impressed. The next day was the photos’ competition. There were some really good photographs and some not so good. I didn’t like the way we voted about them, it was in a rush and we didn’t understand everything.